I spend the past two days in Valerie Goodwin's workshop, Explorations in Color Using the 7 Principles of Design. It was two days well spent! 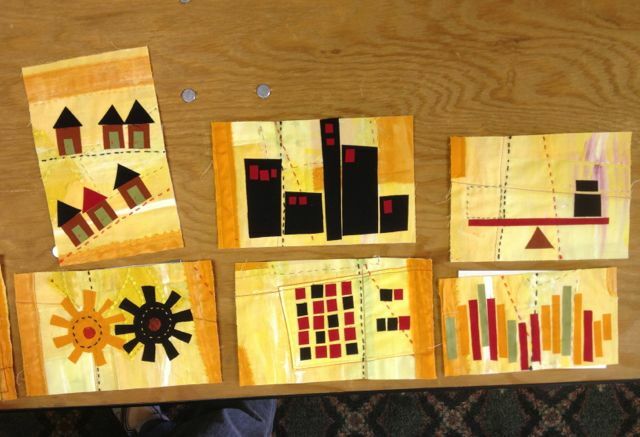 Valerie teaches architectural design in Florida A&M University School of Design in addition to teaching fiber artists about design. Her experience as an instructor meant our two days were well thought out and we were definitely guided through a process. I found Valerie very skillful in working with our individual backgrounds and needs. There were 12 of us in the class so there was plenty of time for individual attention. The workshop opened with a presentation on the 7 principles of design. We then spent the morning creating 4x6 paper collage examples for each design principle. The result was a colorful array of cards that we could then discuss. 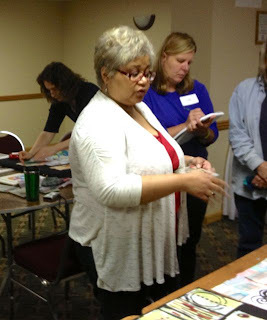 Valerie brought along her own examples which she used through out the two days to reference what she was teaching. After a critique of our paper samples, we spent the afternoon exploring a process that Valerie uses to create a base layer for her own art pieces. Working on a piece of crinolin, we built a layered base using fabric, sheers, and paints. 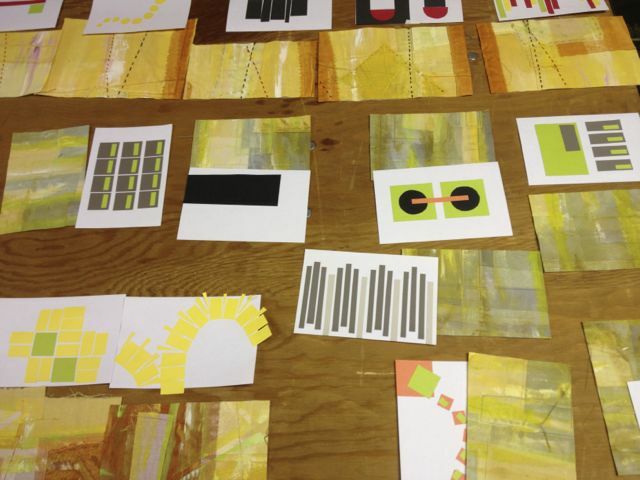 The second day of the workshop was then spent using our paper collages as a reference for creating our own examples of each design principle in a small 4x6 fabric composition. Valerie lectured on various mixed media techniques we could use as we completed our pieces. She then circulated as we worked offering suggestions. I really enjoyed the class for a number of reasons. It was a good review of basic design principles. I found Valerie's approach for creating a base layer intriguing. I suspect that I will consider using crinolin rather than muslin for some of my own works in the future. What was most valuable was the chance to listen to Valerie critique our works and offer suggestions. Her insights were most helpful. Since we also gathered together to critique our works at times, we all had the benefit of each other's viewpoints. I think that really was an added benefit of the class. All in all, we were a diverse group of artists and the class was designed in a manner where we were guided on a path but allowed to follow our own instincts as we worked through the two days. Looks like a very productive class. I've used that index card technique too, and it sure helps with composition, and doesn't use up a lot of fabric. I love the colors you used. I'll look forward to see what fruit comes from this workshop! I can't take credit for any of the work shown - wish I could! It is all by others in the class. I wasn't really focusing on taking photos during the program and least of all mine. Everyone's work was fascinating and I just took a few quick snaps at the end.